Click each location to find out more. Welcome to the John D. Odegard School Of Aerospace Sciences at the University of North Dakota. We are a world-renowned center for aerospace learning, nationally acclaimed for our achievements in collegiate aviation education, atmospheric research, space studies, and computer science applications. With over 500 faculty and staff members, and over 1,500 students from around the world, and a myriad of programs and projects, the John D. Odegard School Of Aerospace Sciences is setting the pace for the future of flight. The Grand Forks Public School System offers its students a high school aviation course, the second of its kind in North Dakota, taught by UND Aerospace faculty. Supported by the Grand Forks Area Career and Technology Center, the class utilizes flight simulators and extensive hands-on activities to expose students to the world of aviation. Located at Crookston, Minnesota; UND Aerospace and University of Minnesota, Crookston (UMC) have partnered to combine UMC’s expertise in Agriculture, Business, Law Enforcement, and Natural Resources with UND Aerospace expertise in Aviation. Located in Phoenix, Arizona; UND Aerospace has partnered with Chandler Gilbert Community College (CGCC) to provide the highest level of aviation education in the Southwestern United States. The Career and Technical Education (CTE) Center, has been part of the Bismarck Public School district for over 25 years. 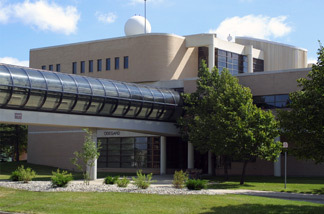 Bismarck CTE Center is located on the campus of Bismarck State College (BSE), and shares space with BSC in the Career Academy and Technical Center Building. One program the Career Academy houses is Aviation. East Valley Institute of Technology (EVIT) high school (East campus) is located at the Phoenix-Mesa Gateway Airport in Mesa, Arizona; near to UND Aerospace Flight Training Center. EVIT, Chandler Gilbert Community College and UND Aerospace Phoenix Flight Training Center have been working together to provide exciting opportunities for aspiring aviators. The Central Florida Aerospace Academy exists to provide a meaningful and content rich education that will inspire and motivate students at all levels. Students are challenged to reach high levels of achievement in science, technology, engineering and mathematics in preparation for high-tech careers in the fields of aviation and aerospace. In addition to UND Aerospace’s Aviation opportunities in North Dakota, the UND Aerospace Foundation also operates collegiate flight training centers in Phoenix, Arizona, and Crookston, Minnesota. Through these unique collegiate relationships, students are given greater opportunities to obtain the highest quality of aviation education at a reasonable cost. UND Aerospace has a passion for Aviation education. It is a exciting to be involved in the lives of young people, introducing them to the incredible world of Aviation. We have listed several high schools where UND Aerospace has the privilege to inspire the imaginations of future aviators. The Tom Wathen Center Big Picture Aviation Academy Charter High School @Flabob Airport has been designed to serve over 400 students and uses the fascination of flight to inspire and motivate lifelong learning in an aviation setting. The elements of the school include a academic development, skill development, and hands on mentoring. This school is the foundation of many after school programs that are available to local and long distance elementary and middle schools. Located in the vast Inland Empire and close to Orange County we can serve a wide range of students at all levels. A direct link to UND is a big asset for us and our students. Last Update: 8/11/2017 Comment on this page.